Succinic acid is a building-block chemical which could be used as the precursor of many industrial products. The dissolved CO2 concentration in the fermentation broth could strongly regulate the metabolic flux of carbon and the activity of phosphoenolpyruvate (PEP) carboxykinase, which are the important committed steps for the biosynthesis of succinic acid by Actinobacillus succinogenes. Previous reports showed that succinic acid production could be promoted by regulating the supply of CO2 donor in the fermentation broth. Therefore, the effects of dissolved CO2 concentration and MgCO3 on the fermentation process should be investigated. In this article, we studied the impacts of gaseous CO2 partial pressure, dissolved CO2 concentration, and the addition amount of MgCO3 on succinic acid production by Actinobacillus succinogenes ATCC 55618. We also demonstrated that gaseous CO2 could be removed when MgCO3 was fully supplied. An effective CO2 quantitative mathematical model was developed to calculate the dissolved CO2 concentration in the fermentation broth. The highest succinic acid production of 61.92 g/L was obtained at 159.22 mM dissolved CO2 concentration, which was supplied by 40 g/L MgCO3 at the CO2 partial pressure of 101.33 kPa. When MgCO3 was used as the only CO2 donor, a maximal succinic acid production of 56.1 g/L was obtained, which was just decreased by 7.03% compared with that obtained under the supply of gaseous CO2 and MgCO3. Besides the high dissolved CO2 concentration, the excessive addition of MgCO3 was beneficial to promote the succinic acid synthesis. This was the first report investigating the replaceable of gaseous CO2 in the fermentation of succinic acid. The results obtained in this study may be useful for reducing the cost of succinic acid fermentation process. Succinic acid, an intermediate in the cycle of tricarboxylic acid (TCA), is one of four-carbon platform chemicals for producing different kinds of petroleum derivatives and biodegradable polymers [1, 2]. Succinic acid could be produced by chemical conversion and microbial fermentation . Because of the rising price, the limited reserves of petroleum and the pollution of environment, the oil-based industries had been prompted a movement towards the bio-based chemicals, and the bio-based succinic acid production had drawn the attention from enterprises and research institutes [4, 5]. As the end-product of the energy metabolism, succinic acid could be produced by many anaerobic microbes, such as Actinobacillus succinogenes, Anaerobiospirillum succiniciproducens, Mannheimia succiniciproducens, Escherichia coli, and other microbes [2, 4, 6, 7]. Especially A. succinogenes ATCC 55618, which is a facultative anaerobe isolated from the bovine rumen . In the production of succinic acid by A. succinogenes, one of the key factors is the supply of CO2. A higher concentration of CO2 could increase the ratio of succinic acid concentration to the other acids production, the ratio of carbon recovery, and the yield of succinic acid . When A. succinogenes and A. succiniciproducens were used for the production of succinic acid, as a kind of co-substrate of phosphoenolpyruvate (PEP)-carboxykinase in the TCA cycle, CO2 could promote carbon flow toward the production of succinic acid [10, 11]. For the other succinic acid production microorganisms such as E. coli and Mannheimia succiniciproducens, CO2 was incorporated into the backbone of three-carbon compound to generate four-carbon oxaloacetate via PEP carboxylase to enhance the production of succinic acid [12, 13]. Because of the poor solubility of gaseous CO2 at 1 atm, many kinds of carbonate and bicarbonate salts were employed as indirect CO2 donor to enhance the dissolved CO2 concentration in fermentation broth. MgCO3 was a preferable carbonate because the addition of MgCO3 would not lead to a radical change of culture pH, and an increase of Mg2+ concentration in fermentation broth showed little negative effect on the metabolism profile and morphology of succinic acid production strain . Some investigators tried to demonstrate the relationship between extra CO2 donors and succinic acid production [9, 15, 16]. But there were a few different features in physiological and biochemical characteristics among various kinds of succinic acid producing strains, and the current results were weak in promoting succinic acid production [15, 16]. In this study, the dissolved CO2 concentration and the addition amount of MgCO3 were quantitatively determined to optimize succinic production by Actinobacillus succinogenes ATCC 55618. To calculate the dissolved CO2 concentration in the fermentation broth, a mathematical model which considers culture pH, temperature, ionic strength, and salt concentration in the fermentation broth were developed. According to the model prediction and experimental verification, this work firstly demonstrated that the supply of gaseous CO2 had no significant effect on succinic acid production when MgCO3 was fully supplied. The strain of A. succinogenes ATCC 55618 was purchased from American Type Culture Collection (ATCC, Manassas USA), which was maintained in 20% glycerol at -70°C. The plate was inoculated with the above strain and incubated at 37°C for 2 days. Preculture medium consisted of the following components (g/L): tryptone 17; soya peptone 3; glucose 2.5; NaCl 5; K2HPO4 2.5, and culture pH was adjusted to 7.1-7.5. For the first preculture, 50-mL medium was prepared in a 250-mL anaerobic bottle, and then a colony from a plate culture was inoculated, and followed by 12-hour incubation at 37°C on a rotary shaker at 120 rpm. For the second preculture, 47.5-mL medium was prepared in a 250-mL anaerobic bottle, and inoculated with 2.5-mL first preculture broth, then followed by 12-hour incubation at 37°C on a rotary shaker at 120 rpm. The stirred-tank bioreactor used was a 5.0-L (working volume) BioFlo 110 New Brunswick Scientific (NJ, USA) agitated bioreactor with two six-bladed Rushton impellers (5.9-cm i.d.). The lower impeller was 2.5 cm above the reactor bottom, and the vertical distance between two impellers was 8.5 cm. The reactor was aerated through a ring sparger with a pore size of 1.0 mm, which was located 2.2 cm above the reactor bottom. The bioreactor was equipped with probes of pH (Mettler-Toledo GmbH, Switzerland), temperature and foam. Fermentation medium was composed of (g/L): glucose 100; yeast extract (YE) 16; corn steep liquor (CSL) 12; KH2PO4 3; NaCl 1; MgCl2·6 H2O 0.3; and CaCl2·2 H2O 0.3. Fermentation was conducted at 37°C and inoculated with 5% (v/v) of the second preculture broth. The rotation speed and external CO2 gas sparging rate was 200 rpm and 0.1 vvm. The pH was adjusted to 7.5 with 28% (w/w) ammonia solutions. Four cultures were carried out simultaneously in the stirred-tank bioreactors with homogeneous cell source under well-controlled process conditions but under different culture conditions. The identical cell source and process conditions, other than the experimental condition, made it possible to perform accurate head-to-head comparisons. The results presented here were confirmed to be reproducible in another experiment (data not shown). Where PCO2 is the CO2 partial pressure (kPa) in gas mixture which is determined by the mixing ratio of CO2 and N2, H is the Henry's constant for CO2 in the fermentation broth (kPa·L/mol), and CCO2 is the dissolved CO2 concentration in the fermentation broth (mol/L). where b G, 0 and b G, T for CO2 are -1.86 × 10-4 m3/kg and 0.01 × 10-4 m3/kg·K, respectively, between 283-303 K . Combining Equations (2), (3) and (4), a model of Henry's constant for CO2 in fermentation medium could be obtained. In Equation (5), the Henry's constant of CO2 in the pure water was 4320 kPa L/mol . T is the absolute temperature (K) in culture condition. 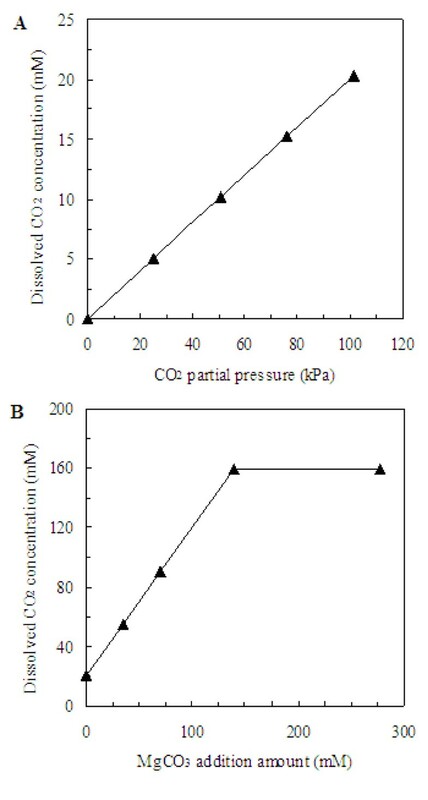 After combining all the parameters mentioned above into the Equation (5) and Equation (1), the model used for calculating CO2 dissolved concentration in broth could be obtained when gaseous CO2 was used as external CO2 donor and the result is shown in Figure 1A. There is a correlated linear trend between CO2 partial pressure and the dissolved CO2 concentration in fermentation broth. The dissolved CO2 concentration in the fermentation broth was 5.05, 10.11, 15.16 and 20.22 mM when CO2 partial pressure was 25.33, 50.66, 75.99 and 101.33 kPa, respectively. And the maximal dissolved CO2 concentration is 20.22 mM due to the solubility of gaseous CO2. Effects of gaseous CO 2 and MgCO 3 on the dissolved CO 2 concentration in the fermentation broth. (A): The dissolved CO2 concentration in the fermentation broth with the sole supply of various CO2 partial pressures. (B): The dissolved CO2 concentration in the fermentation broth with the addition of various amount of MgCO3 at the CO2 partial pressure of 101.33 kPa (i.e., 100% CO2 gas). As reported in the previous study , the maximum solubility of MgCO3 in water at 40°C was 139 mM. According to Equation (1), (5), (6) and (7), the model used for calculating the dissolved CO2 concentration in the fermentation broth could be obtained when both gas phase CO2 and MgCO3 were used as CO2 donors, and the relationship between the addition amount of MgCO3 and the dissolved CO2 concentration under the CO2 partial pressure of 101.33 kPa is shown in Figure 1B. The CO2 concentrations in the fermentation broth were 20.22, 54.97, 89.72, 159.22 and 159.22 mM when the addition of MgCO3 was 0, 2.92, 5.84, 11.68, and 23.35 g/L, respectively. And the maximum dissolved CO2 concentration is 159.22 mM due to the solubility of gaseous CO2 and MgCO3. The significance of gaseous CO2 partial pressure on succinic acid accumulation was studied by setting CO2 partial pressure at 25.33, 50.66, 75.99 and 101.33 kPa during the whole fermentation process in the stirred-tank bioreactors, which was controlled by adjusting the corresponding mixing ratio of CO2 and N2 at 25%, 50%, 75%, 100% (v: v) by gas mix controller (BioFlo110, New Brunswick Scientic NJ, USA), respectively, and the corresponding dissolved CO2 concentration in the fermentation broth was 5.05, 10.11, 15.16, and 20.22 mM. The maximal dissolved CO2 concentration in the fermentation broth was 20.22 and 139.00 mM when only gaseous CO2 and MgCO3 was supplied, respectively. In order to study the higher dissolved CO2 concentration on the succinic acid production, the fermentations were conducted by adding MgCO3 to enhance the dissolved CO2 concentration. MgCO3 was added to the broth after a separate sterilization before the inoculation. The effect of the supply of gaseous CO2 and the addition of MgCO3 on the fermentation process was studied by adding 2.92, 5.84, 11.68, and 23.35 g/L of MgCO3 at the CO2 partial pressure of 101.33 kPa (i.e., 100% CO2 gas), and its corresponding dissolved CO2 concentrations in the fermentation broth were 54.97, 89.72, 159.22 and 159.22 mM, respectively. The dissolved CO2 concentration maintained constant at 159.22 mM even when concentrations higher than 11.68 g/L of MgCO3 were added at the CO2 partial pressure of 101.33 kPa. The other culture conditions were the same as the above experiments. Effect of the excessive addition amount of MgCO3 was studied by adding 30, 40, 50 and 60 g/L of MgCO3 at the CO2 partial pressure of 101.33 kPa (i.e., 100% CO2 gas), and all the corresponding dissolved CO2 concentration in the fermentation broth was 159.22 mM. The other culture conditions were the same as the above experiments. According to the above results and Equation (5), the effect of CO2 donor supply mode was studied by using two supply modes: 40 g/L MgCO3 was used as the only CO2 donor, and 40 g/L MgCO3 was supplied at the CO2 partial pressure of 101.33 kPa (i.e., 100% CO2 gas). The other culture conditions were the same as the above experiments. For sampling, about 20-30 mL of broth was taken once from each reactor and the cell growth was monitored by measuring the optical density at 660 nm (OD660). At an OD660 of 1.0, A. succinogenes ATCC 55618 has a concentration of 0.626 g dry cell weight (DCW)/L. For succinic acid determination, 1 mL methanol and 1 mL acetonitrile were added to 1 mL fermentation broth to remove protein and the sample was kept at 4°C overnight. After centrifuging at 11, 000 rpm for 30 min, the supernatants were diluted and filtrated through 0.22 μm filter, then analyzed by high-performance liquid chromatography (HPLC, Dionex) using Maisch ReproSil-Pur Basic C18 column. The optimized mobile phase was 5 mM KH2PO4 water solution, whose pH was adjusted to 2.8 by H3PO4. The column oven temperature was maintained at 40°C and the flow rate was 1 mL/min. The detection wave was 210 nm. Residual sugar level was assayed with phenol-sulfuric acid method . As one of the direct substrates for the biosynthesis of succinic acid, CO2 could affect the metabolic flux and the mass distribution of succinic acid [8, 21]. The quantitative determination of the dissolved CO2 concentration in the fermentation broth is beneficial to study the impact of CO2 partial pressure on the production of succinic acid. Song et al. and Lee et al. reported that succinic acid production could be enhanced by increasing CO2 partial pressure in the fermentation of M. succiniciproducens and A. succiniciproducens. Therefore, it was necessary to investigate the effect of CO2 partial pressure on the accumulation of succinic acid by A. succinogenes ATCC 55618. The effect of CO2 partial pressure on the succinic acid production is shown in Figure 2A. When the CO2 partial pressures were 25.33, 50.66, 75.99, and 101.33 kPa, the dissolved CO2 concentrations in the fermentation broth calculated using Equation (5) was 5.05, 10.11, 15.16, and 20.22 mM, respectively (Table 1). And at the CO2 partial pressure of 101.33 kPa, the maximal dissolved CO2 concentration achieved was 20.22 mM, which was the highest dissolved CO2 concentration when only gaseous CO2 was supplied. The dissolved CO2 concentration was increased with the increase of the partial pressure when gaseous CO2 was used as sole CO2 donor. The succinic acid productions were 8.84, 10.21, 10.44, and 10.97 g/L as obtained on 48 hour at the CO2 partial pressure of 25.33, 50.66, 75.99, and 101.33 kPa, respectively, and its corresponding productivities were 0.18, 0.21, 0.22, and 0.23 g/L per hour. This indicated that when gaseous CO2 was used as the sole CO2 donor, CO2 partial pressure showed no significant effect on the succinic acid accumulation. On the contrary, as reported by Lu et al. and Samuelov et al. , a higher available CO2 concentration could cause higher succinic acid production by increasing the activity of PEP carboxykinase. These indicated that when gaseous CO2 was used as the sole CO2 donor, the available dissolved CO2 concentration was not high enough to increase the production of succinic acid in the fermentation of A. succinogenes. Effect of CO 2 partial pressure on the succinic acid production during the A. succinogenes fermentation. (A) the succinic acid production, (B) the acetic acid production, (C) the sugar consumption. a Gas mixture was composed of CO2 and N2. b - means the CO2 donor was not add. As shown in Figure 2B, the patterns of acetic acid production at various CO2 partial pressures were similar. The concentrations of other by-products such as formic acid, lactic acid and ethanol were relatively constant at around 5.0, 11.0 and 2.0 g/L, respectively, regardless of the levels of the dissolved CO2 in the broth. Figure 2C shows the time profile of residual sugar under various CO2 partial pressures. The glucose concentration at the CO2 partial pressure of 101.33 kPa was decreased faster than that at other CO2 partial pressures during the first 24 hours. The yield of succinic acid against glucose was around 0.21 g succinic acid/g glucose when gaseous CO2 was used. That means the CO2 partial pressure showed no significant effect on the succinic acid yield. And there was no significant effect on the cell growth. The OD660 was between 6.0 and 6.7 when gaseous CO2 partial pressure was 25.33, 50.66, 75.99, and 101.33 kPa (Table 1). The maximal dissolved CO2 concentration is limited by the solubility of gaseous CO2 when it was supplied as the sole CO2 donor. In order to investigate the effect of higher dissolved CO2 concentration on succinic acid production, the fermentations were conducted by adding MgCO3 at the CO2 partial pressure of 101.33 kPa (i.e., 100% CO2 gas) to enhance the dissolved CO2 concentration in the fermentation broth. The effect of the supply of gaseous CO2 and the addition of MgCO3 on the fermentation process was studied by adding 2.92, 5.84, 11.68, and 23.35 g/L of MgCO3 at the CO2 partial pressure of 101.33 kPa (i.e., 100% CO2 gas), and the corresponding dissolved CO2 concentrations was 54.97, 89.72, 159.22, and 159.22 mM. Because of the solubility of MgCO3 and CO2, the maximal dissolved CO2 concentration of 159.22 mM was obtained under the addition of 11.68 g/L MgCO3 with 100% CO2 gas. Even more than 11.68 g/L of MgCO3, the dissolved CO2 concentration maintained constant at 159.22 mM. As shown in Figure 3A, the highest succinic acid productions were 15.26, 15.94, 25.86 and 36.84 g/L as obtained on 48 hour with the addition of 2.92, 5.84, 11.68 and 23.35 g/L MgCO3, respectively, and its corresponding productivity was 0.32, 0.33, 0.54 and 0.77 g/L per hour, respectively. The maximum succinic acid production was increased from 25.86 to 36.84 g/L when the addition amount of MgCO3 was increased from 11.68 to 23.35 g/L, while the dissolved CO2 concentration was maintained constant. It can be concluded that the higher dissolved CO2 concentration was beneficial for the succinic acid biosynthesis. But the dissolved CO2 concentration was not the only factor affecting succinic acid synthesis; the excessive MgCO3 also had positive effect. As a kind of neutralization reagent, MgCO3 could promptly neutralize the organic acid produced during the fermentation process. But when only 11.68 g/L of MgCO3 was added, the saturated state of MgCO3 would be lost quickly because of the rapid accumulation of organic acid during the fermentation. And when the addition amounts of MgCO3 exceeded 11.68 g/L, there will be excessive solid MgCO3 precipitate. Even if organic acids accumulate, MgCO3 solution can also keep saturated. Effect of the supply of gaseous CO 2 and the addition of MgCO 3 . (A) the succinic acid production, (B) the acetic acid production, (C) the sugar consumption. The fermentation was performed at the CO2 partial pressure of 101.33 kPa. Equation (6) and (7) indicated that the dissolved concentrations of HCO3-, CO32- and CO2 could be enhanced with the addition of MgCO3 in the fermentation broth. However, MgCO3 may not be used as CO32- donor because there were few reports that CO32- could be used directly as substrate by succinic acid producing microorganisms. Although HCO3- and CO2 could be used as the co-substrate of PEP carboxylase and improve the production of succinic acid , HCO3- was much less permeable to lipid cell membrane than the uncharged CO2 molecule because is a kind of polar molecular, and there was no HCO3- transporter on the membrane of A. succinogenes which could deliver HCO3- from the broth into the cell . So the higher concentration of HCO3- could not promote the production of succinic acid. And MgCO3 may be used as indirect CO2 molecule donor to promote the production of succinic acid in the fermentation process of A. succinogenes. On the other hand, when the levels of dissolved CO2 reached 159.22 mM, there would be insoluble MgCO3, and that could cause turbid broth. The cells were spread uniformly in the broth, which was helpful to eliminate the cell flocculation and indirectly promoting the succinic acid biosynthesis. As shown in Figure 3B, the patterns of acetic acid production at the dissolved CO2 concentration of 54.97 and 89.72 mM were similar. However, when the levels of dissolved CO2 reached 159.22 mM, the acetic acid production was significantly enhanced. It was distinct from other reports. In the fermentation of M. succiniciproducens, the levels of dissolved CO2 showed little effects on the acetic acid accumulation . The CO2 concentration has been shown to regulate the levels PEP carboxykinase pathway at high CO2 levels, and PEP carboxykinase levels rise . However, the enhanced PEP carboxylation may cause higher glucose consumption rate. This effect may cause more metabolic flow by PEP to pyruvic acid, and further to acetic acid. Meanwhile the production of formic acid, lactic acid and ethanol almost not be improved may be because the raised PEP carboxykinase activity competitively inhibited these key enzymes such as pyruvate formatelyase, lactate dehydrogenase and ethanol dehydrogenase. The patterns of cell growth with the addition of different concentration of MgCO3 were similar, and the OD660 was between 9.7 and 10.9 (Table 1). Figure 3C shows the time profile of residual sugar under various addition amount of MgCO3. When 23.35 g/L of MgCO3 was added, glucose was consumed faster than the other conditions between 12 and 24 hour, which corresponded well to the succinic acid accumulation. The yield of succinic acid against glucose was 0.27, 0.26, 0.38, and 0.45 g succinic acid/g glucose when the addition amount of MgCO3 was 2.92, 5.84, 11.68 and 23.35 g/L, respectively. This indicated that the higher dissolved CO2 concentration could effectively improve the yield of succinic acid against glucose. Effect of the higher addition amount of MgCO3 was studied by adding 30, 40, 50 and 60 g/L of MgCO3 at the CO2 partial pressure of 101.33 kPa (i.e., 100% CO2 gas), and all the corresponding dissolved CO2 concentration in the fermentation broth were 159.22 mM. As shown in Figure 4A, the pattern of succinic acid production under various addition amount of MgCO3 within the range of investigation was similar. The maximal succinic acid production of 53.55, 61.92, 61.48, and 58.05 g/L was obtained with the addition of 30, 40, 50, and 60 g/L MgCO3, respectively, and its corresponding productivity was 0.74, 0.86, 0.85 and 0.81 g/L per hour. When the addition amount of MgCO3 exceeded 40 g/L, the production and productivity of succinic acid were kept almost constant, but the specific productivity was decreased. This indicated 40 g/L MgCO3 was enough for improving the accumulation of succinic acid. Similarly, Du et al. reported when the addition amount of MgCO3 exceeded 30 g/L, there was no significant change on the production of succinic acid. Effect of the excessive addition amount of MgCO 3 on the succinic acid production. (A) the succinic acid production, (B) the acetic acid production, (C) the sugar consumption. The significance of addition amount of MgCO3 on acetic acid accumulation was studied. As shown in Figure 4B, there was no significant effect on the biosynthesis of acetic acid. Similarly, the concentrations of other by-products such as formic acid, lactic acid and ethanol were relatively constant at around 5.0, 11.0 and 2.0 g/L, respectively, regardless of the addition amount of MgCO3. The cell growth patterns under the addition of MgCO3 were quite similar (Table 1). Figure 4C shows that the time profile of residual sugar under various addition amount of MgCO3. The yield of succinic acid against glucose was 0.56, 0.60, 0.64, and 0.63 g succinic acid/g glucose when the addition amount of MgCO3 was 30, 40, 50 and 60 g/L, respectively. It seemed that to obtain a higher yield of succinic acid against glucose, the addition amount of MgCO3 should no be more than 50 g/L. Gaseous CO2 was widely used as external CO2 donor and anaerobic environment maintenance agent in succinic acid fermentation process. Calculated from Equation (5, 6, 7), the dissolved CO2 concentration (139.00 mM) under 40 g/L MgCO3 was just decreased by 12.76% comparing with that obtained under the addition of 40 g/L MgCO3 with 100% CO2 gas. This suggested that the gaseous CO2 may be removed by the addition of MgCO3. In order to testify this proposal, the effect of CO2 donor supply mode was studied by using two supply modes: 40 g/L MgCO3 was used alone; 40 g/L MgCO3 was supplied with 100% CO2 gas. As shown in Figure 5A, after 72 h incubation, the production of succinic acid reached 56.14 and 60.38 g/L when 40 g/L MgCO3 was used as the only CO2 donor and 40 g/L MgCO3 was supplied at the CO2 partial pressure of 101.33 kPa, and the corresponding productivity was 0.80 and 0.84 g/L per hour. The succinic acid production was just decreased by 7.03% without the supply of gaseous CO2. As shown in Figure 5B, the acetic acid production was decreased by 17.91% without the supply of gaseous CO2. Figure 5C clearly shows the time courses of sugar consumption under different CO2 supply modes were similar. The yield of succinic acid against glucose was 0.54 g succinic acid/g glucose when 40 g/L MgCO3 was used alone, and the yield was 0.58 g succinic acid/g glucose when MgCO3 was supplied with 100% CO2. And there was no significant effect on the cell growth whether gaseous CO2 was used. Effect of CO 2 donor supply mode on succinic acid production during the A. succinogenes fermentation. (A) the succinic acid production, (B) the acetic acid production, (C) the sugar consumption. In this study, an effective CO2 quantitative mathematical model was developed to calculate the dissolved CO2 concentration in the broth during the fermentation of Actinobacillus succinogenes ATCC 55618. The model offered a quantitative method for screening the suitable CO2 donor form and addition amount for the production of succinic acid. There was no significant effect of CO2 partial pressure on the production of succinic acid when gaseous CO2 was used as the sole CO2 donor. But when gaseous CO2 was used with MgCO3, higher amount of MgCO3 was more effective on promoting the succinic acid synthesis. And the maximum succinic acid production of 61.92 g/L was obtained at 159.22 mM dissolved CO2 concentration, which was supplied by 40 g/L MgCO3 with 100% CO2 gas. And it was concluded that the supply of gaseous CO2 was not essential when 40 g/L of MgCO3 was added in the fermentation medium. This is the first report investigating the replaceable of gaseous CO2 in the fermentation of succinic acid. The results obtained in this study may be useful for reducing the cost of succinic acid fermentation process. Financial support from the following funding agencies is gratefully acknowledged: the National Natural Science Foundation of China (NSFC, Project Nos. 20976038 and 21176059), the Key Project of Chinese Ministry of Education (Project No. 210132), the Hubei Provincial Natural Science Foundation for Innovative Research Team (Project No. 2008CDA002), the Scientific Research Key Project of Hubei Provincial Department of Education (Project No. Z20101401), the Discipline Leader Project of Wuhan Municipality (Project No. 200951830553), the Key Technology R&D Program of Wuhan Municipality (Project No. 201120822280-2), the Open Project Programs for the Key Laboratory of Fermentation Engineering (Ministry of Education), the National Key Laboratory of Biochemical Engineering (Project No. 2010KF-06), and the State Key Laboratory of Bioreactor Engineering. Ya-Jie Tang also thanks the Chutian Scholar Program (Hubei Provincial Department of Education, China) (2006). YJT and WZ designed the experiments, WZ carried out the experimental work, LWZ and WZ analyzed data, WZ drafted the manuscript, HML provided some critical discussions and support for this project. YJT and LWZ critically reviewed and modified the paper. All authors approved the final manuscript.